:: Alan Smurfit took down Event #33 ($1,500 PLO w/ rebuys), smurfing the competition. 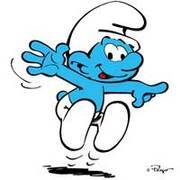 For the win, Smurfit smurfed $464,867. Chau Giang smurfed in fifth ($96,005), Brandon Adams was sixth ($75,794), and Erick Lindgren smurfed in tenth ($21,054). :: Tony Soprano Jeffrey Lisandro ($118,426) defeated…dare we say…a star-studded Seven Card Stud final table (Event #32, $2,000 7CS) that included Nick Frangos (second, $65,902), Davidson Matthew Club member Nesbitt Coburn (third, $42,643), Daniel Negreanu (fifth, $21,321). Howard Lederer finished tenth ($6,203), as did Mel Judah. :: Save "Viet" Nam Le, a bunch of dudes you’ve probably never heard of make up the Event #35 final table ($1,500 NLH). :: Alexander Borteh captured Event #34 ($3,000 Limit Hold’em), banking $225,483. :: And Massimo Reynaud leads the Event #36 ($5,000 Omaha Hi/Lo) final table, stacked at 529,000. Randy "Dreamcrusher" Jensen is fifth at 283,000.